this safe, energy-efficient, reliable heater is our favorite type by a mile! 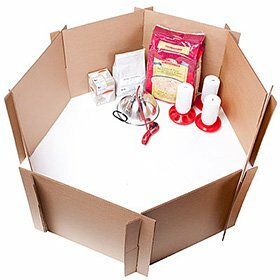 They are far, far safer than the traditional heat lamp alternative, and will save you money on electricity in the long run. Plus, they're designed and manufactured in the USA. Please see below for full product features and benefits. Sweeter Heaters use only 32 watts (11" x 11" model) to 150 watts (11" x 40" model), depending on the size, versus 250 watts on a traditional heat bulb. Lower cost over the long haul. In our experience, chicks are by far the happiest with the Sweeter Heater and similar models like the Cozy Coop Heater and these Chick Heating Plates. In fact, when we first switched to the Sweeter Heater, our chicks were so quiet, we thought something was wrong with them! We realized that the bright heat bulb we'd been using agitates them. And it makes sense--wouldn't a glaring red light shining on you day and night agitate you, too? Chicks under a Sweeter Heater are are content all day long, and they sleep peacefully all night long--no loud chirping to keep you awake! No dials to fiddle with--simply plug in the Sweeter Heater and adjust the height on the overhead mount, or mount to a side wall for full-grown hens in winter. Use in your "big girl" coop in the winter, too! You can adjust the location of your Sweeter Heater to give your flock just enough heat to take the edge off--without warming them so much that the hens would not be able to cope with the loss of heat should the power suddenly cut out. Yes, sometimes you'll find that your hens like to jump atop the (overhead mount) Sweeter Heater and leave a not-so-sweet mess! The good news is that The sealed plastic shell on top of the Sweeter Heater is easy to spray and wipe down. Chick Heating Plates, like the Sweeter Heater, are an excellent alternative to a 250-watt, infrared heat bulb. There are three important differences between Sweeter Heaters and Chick Heating Plates, however. 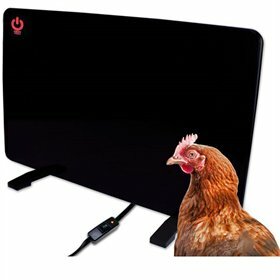 Chick Heating Plates max out at 125 degrees F. Sweeter Heaters max out at 185 degrees F.
Chick Heating Plates have an adjustable stand and don't require being hung or mounted. The largest Chick Heating Plate can accommodate 40 chicks, but doesn't have enough space underneath to accommodate grown chickens (using it in their coop for winter, for instance), whereas the largest Sweeter Heater can accommodate 100 chicks and grown chickens of all heights. 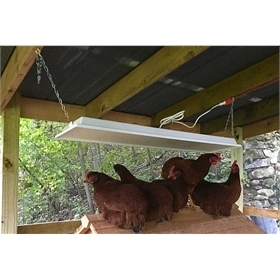 We recommend the Sweeter Heater overhead mount if you're brooding your chicks in a colder place: porch, garage, barn, basement, or an outdoor structure where 110 degrees won't be enough. 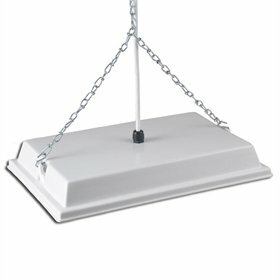 If, on the other hand, you only plan to use your Sweeter Heater in a coop during the bitter winter, you might consider the side-mount option as it doesn't require hanging. Keep in mind that it'll need to be mounted relatively close to where your flock roosts in order to be of benefit to them, as even the largest size won't appreciably increase the ambient temperature of a very large volume of air (a large shed, say). The Chick Heating Plates, by contrast, are awesome for folks who don't have a good place to hang their heater, who plan to brood fewer than 40 chicks inside their house, and who don't intend to use them to heat coops. Run your Sweeter Heater for a few hours, until the faint "new plastic" smell dissipates, before introducing chicks. It is recommended to start your Sweeter Heater around five inches off the ground. Then, watch your chicks' behavior closely when they first enter their brooder: if they avoid the heat, raise it up. If they huddle underneath it and chirp loudly, lower it. It's as simple as that. Installation instructions. 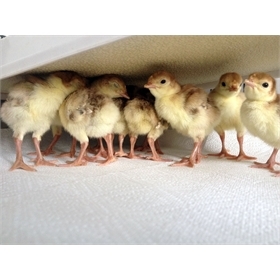 Please bear in mind when choosing your size that ambient temperature, draftiness and hanging height of your Sweeter Heater highly influence the number of chicks you can effectively heat. The "maximum" numbers quoted below are based on a draft-free environment, with an ambient temperature of seventy degrees Fahrenheit, and with the heater hanging 4.5 to 5 inches above the ground. The draftier the brooder space, the lower the ambient temps, and the higher you hang your Sweeter Heater, the larger size you will need. (Always keep chicks in a low-draft environment, by the way: excessive drafts will kill chicks, no matter how warm you keep their brooder. Even a large cardboard box will suffice to prevent drafts.) In short, our recommendation is that when you're in doubt about the best size to get, play it on the safe side and choose something larger. Designed, sourced and assembled in the USA! The mom-and-pop manufacturer is so sure of their product, they offer a three year warranty against defects in material and workmanship. Should you run into any problems, just contact us, and we'll take care of the rest.